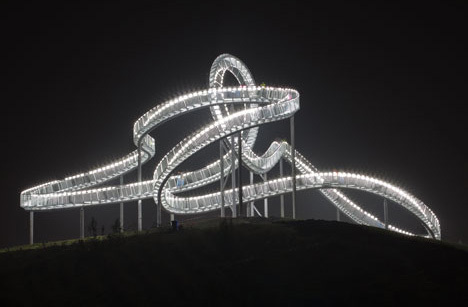 From a distance, this structure looks like just another winding, looping roller coaster. But look a little closer and you’ll see that all is not as it appears. 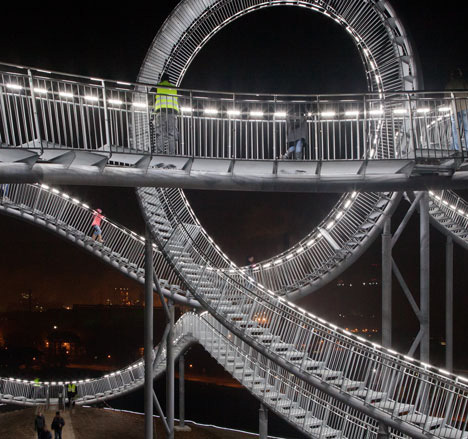 This roller coaster is actually a fantastical staircase: a human-scale outdoor sculpture that just begs to be walked by visitors. 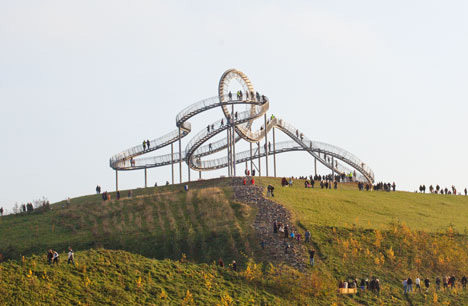 The sculpture is called Tiger and Turtle – Magic Mountain. 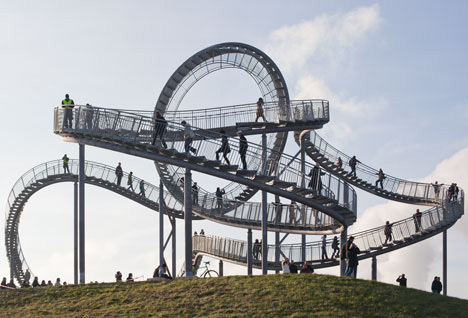 Created by Heike Mutter and Ulrich Genth, the sculpture opened to the public on November 13, 2011. 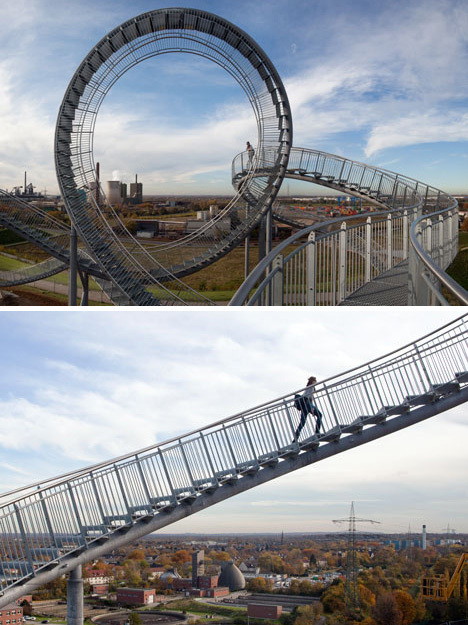 It sits atop a high hill in Duisburg, Germany, offering visitors the chance to take a walk 29 meters (almost 70 feet) above the ground. From its perch on the hill, the massive sculpture offers an exceptional view of the surrounding area and a unique pedestrian experience for those who dare to tread so far above the soil. 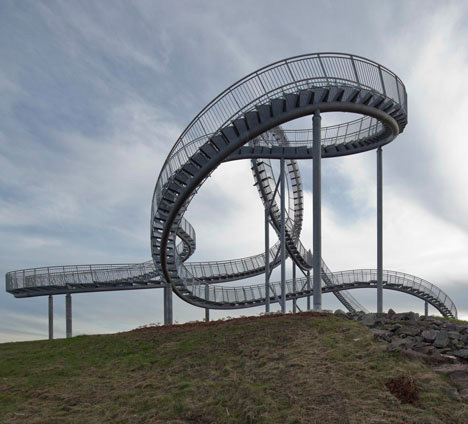 The elaborately winding and swooping staircase has access points where it touches the ground, allowing visitors to climb on and experience the strange sensation of exploring the elevated walkway. The carnival rides on which the sculpture is based typically draw crowds based on their thrill-inducing loops. But for the Tiger and Turtle sculpture, the central loop is a hindrance to travel rather than a thrilling part of it. The very presence of the loop makes it impossible for one to walk the entire length of the structure. The sculpture’s rather unusual name comes from the changing perceptions one experiences while drawing nearer and nearer to the structure. At first, from a distance, it appears to be a thrill ride that zips passengers around at dizzying speeds. But upon closer inspection, it becomes apparent that the pace of this particular “ride” is far more relaxed. According to the sculptors, there is another, more serious story behind the Tiger and Turtle title. It refers to the simultaneous speed and deadlock of progress in the surrounding area with regards to environmental reform. Although there is a valuable message in the sculpture, if one chooses it can still be enjoyed on a superficial level – which is what makes public art so fun.